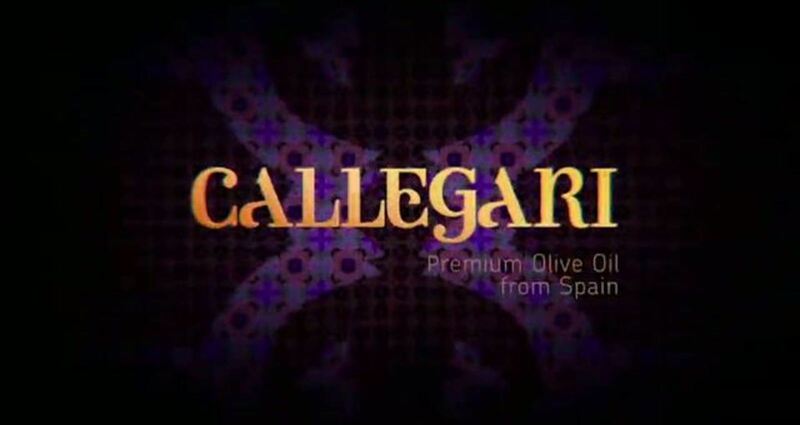 Callegari Olive Oil is a new Premium Extra Virgin Olive Oil is imported from Spain and sold in the US. Pereira & O’Dell drew inspiration for the brand identity from the brightly colored, almost mosaic, Spanish tiles. To introduce a premium olive oil sought-after by chefs, food buyers and foodies who know the value of the very highest quality extra virgin olive oils. The bottle must be elegant yet functional and include limited edition and promotional items to turn both foodies and chefs into brand ambassadors. The compelling design should spark a change in consumers' behavior, now bringing the product bottle to the table instead of using olive oil dispensers. The packaging includes two styles of bottle. The first is a perfectly minimal and modern specialty glass bottle that can stand upright and also inclined on its side, becoming a centerpiece-worthy decanter that provides natural aeration to release the aroma of the olive oil. Our hero bottle is a golden droplet, reminiscent of the purity and simplicity. The top is wrapped in its signature Spanish tile pattern and trimmed in turquoise. The bottle suits both the stay at home cook and the professional chef. Smell and taste, it is well known, are two senses that are strongly tied together. The second Callegari bottle is a classic perfume bottle with purple atomizer, perfect for salads, and highlights the unparalleled aroma of Callegari Olive Oil. Additionally, the pen is a promotional item that conveys the elegant presence of Callegari olive oil by allowing chefs to sign their signature dishes and at the same time become brand ambassadors. The translucent stacking plates are perfect for cocktail parties. Alone they are a deconstructed mosaic that stacks together to create the Callegari logo in purple, gold and blue. As part of the overall brand program Pereira & O’Dell also designed a series of posters to launch the product in special US luxury retail markets. Callegari first debuted at the Michelin Gala Dinner in NY and SF in October 2012, when an initial run of the product was distributed among some of the most respected world chefs. Due to the very positive response the design successfully secured the necessary investment to establish the brand.